You may already understand the business value of gender diversity. You may know that an organization can only achieve sustainable gender diversity in leadership by having an inclusive culture. But enrolling others in creating a culture of inclusion requires that you present a clear business case that fits your industry and organization. It requires that the leaders of your organization understand the business value of inclusion and gender diversity. This article will get you started (or fill in gaps in your business case) so you can get more managers to appreciate what’s in it for them. It is divided into two parts: the business benefit of an inclusive culture generally and the business benefit of gender diversity in particular. It includes significant costs that can be avoided and significant gains to be captured. Engagement, Inclusion and Results: Engagement has been convincingly linked with productivity, profitability, employee commitment and retention. An organization where more of today’s diverse workforce is engaged is an inclusive workplace. According to Cumulative Gallup Workplace Studies cited in “Business Case for Diversity with Inclusion,” organizations with inclusive cultures do better on several scores than those that aren’t inclusive – with 39% higher customer satisfaction, 22% greater productivity and 27% higher profitability. Decreased Turnover: Turnover has significant direct and indirect costs. According to the Gallup Study just cited, companies with inclusive cultures have 22% lower turnover. As the economy recovers, turnover will become more front-of-mind for business leaders; studies show a staggering percentage of employed Americans (particularly Millennials) indicate they intend to look for a new job once the economy improves. Easier Recruitment: An organization with a reputation for being a good place to work for diverse groups has an easier time recruiting talent from today’s diverse hiring pool. That saves money and time. Better Decisions: Many people have a sense that decisions are better when they come from a group with diverse backgrounds and perspectives. A recent study from the Kellogg School of Management concludes that heterogeneous groups getter better results than homogeneous groups because the tension or discomfort leads to more careful processing of information. Diverse Markets: Businesses with diverse workforces have an easier time tapping the diverse marketplace. The buying power and influence of “minority” groups are large and growing according to buying power studies like that from the Terry College of Business. Gender Diversity and Returns: Catalyst, a research and consulting organization focusing on women in business, and McKinsey have both shown correlations between gender diversity in leadership and the bottom line. Catalyst found significantly higher returns in Fortune 500 companies with more women at the top and on their boards of directors. McKinsey found that, of 89 listed companies studied, those with gender diversity in leadership experienced higher return on equity, operating profit, and stock price. While neither Catalyst nor McKinsey say that having women in leadership causes better results, the numbers indicate that having both men and women in leadership is good for the bottom line. 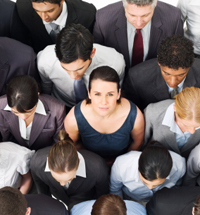 Women in the Hiring Pool: According to The Shriver Report, women are now half of the workforce and hiring pool. According to the U.S. Department of Education data and projections, the pool of educated workers has and will continue to have more women than men as women earn more undergraduate and graduate degrees than men. It’s simple: To have the most skilled and talented workforce, a business must attract and retain women as well as men. The Women’s Market: A diverse culture that mirrors its markets tends to do better than its homogeneous competitors. The women’s market is key to many industries as women are important decision-makers, customers and potential customers. Women influence more than 85% of retail decisions. Women are decision-makers in more and more business-to-business relationships. Women-owned businesses are a growing sector of the U.S. economy. Bang for the Buck: If a business wants to increase engagement and retention from any group other than the group most highly represented at the upper levels of business (white, male, heterosexual, Christian), the largest return may be in increasing engagement in the largest such group–women. And there is more bang for the buck. Women’s needs and approaches to work are shared by other growing sectors of the workforce. Members of Generation X and Millennials share women’s need for flexibility, desire for closer workplace relationships and preference for less hierarchical structures. Steps to make a culture work better for women will also make it work better for these growing workforce sectors. Creating an inclusive culture is great for those who would otherwise feel less included. Supporting the advancement of women in business is great for women. But these aren’t the ultimate goals; and they won’t inspire action. Inclusive cultures and organizations with gender-diversity achieve superior business outcomes–customer satisfaction, retention, productivity and profitability. That’s what can drive action and culture change. Caroline Turner is a business consultant, advising clients on creating cultures of inclusion, facilitating workshops and delivering speeches. Formerly, she was the Senior Vice President at Coors Brewing Company (now MillerCoors and MolsonCoors). Her new book is Difference Works: Improving Retention, Productivity and Profitability through Inclusion.